As a producer, for each video shoot I attend – whether marketing videos, web videos, business videos of any kind, documentaries, whatever! – I bring a checklist of all the details I want to capture in interviews and b-roll (visuals). But I view this list as more of an outline than a blueprint; invariably we find surprises along the way, the inclusion of which enhance final productions (as well as our own experiences, since having fun is also, always, part of the program). A good recent example happened a week and a half ago. We were videotaping in Austin, Texas, updating an informational video for the Teacher Retirement System (TRS) of Texas (more about the update tomorrow). We stepped outside during an interval between interviews to get some b-roll and chanced upon a huge ceremony unveiling the Tejano Monument which was taking place at the Capitol, across the street from TRS’ office. 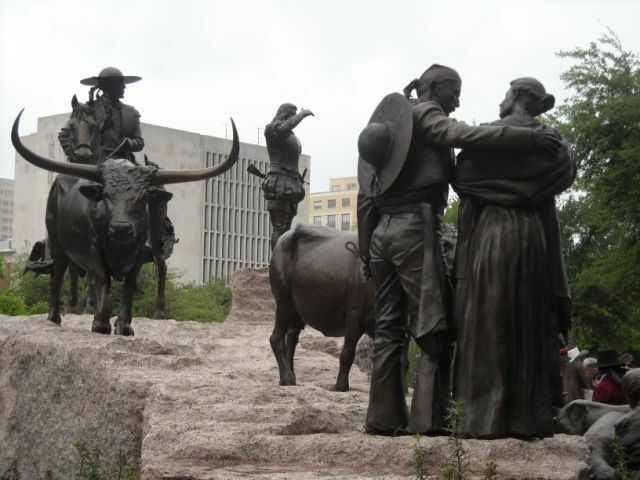 The Tejano was 12 years in the making, a grandiose undertaking by sculptor Armando Hinojosa, depicting the early Spanish explorers and Tejano families, who introduced cattle ranching and farming. The sculpture includes a life-size scene, encompassing an equine statue with a cowboy, two longhorn cows, a family of settlers, and a Spanish explorer standing on a raised mesa, surveying the land before him. 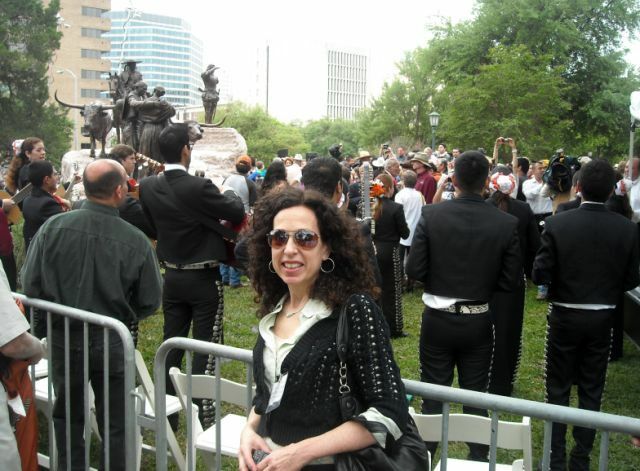 The work was significant since it was the first of 18 others on the Capitol grounds to celebrate the contributions of Texas’ early Spanish and Mexican explorers, settlers, and their descendants. 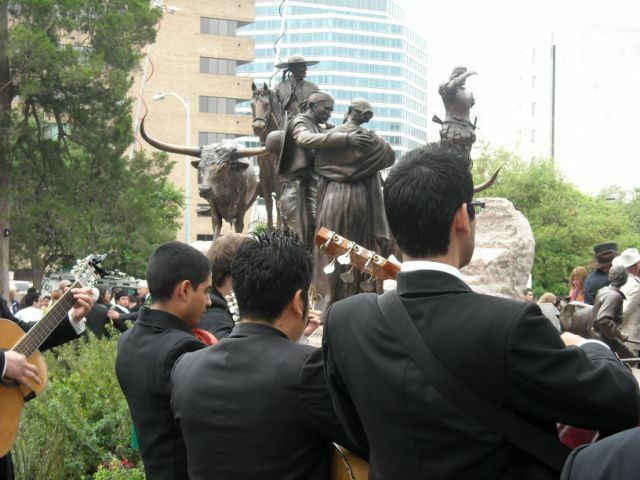 Attended by hundreds of people, the unveiling ceremony was heralded with a Mariachi band whose members are students at University of Texas and who paraded through the streets for much of the remainder of the day trumpeting their contagious dancing melodies. Roll the cameras! One of the messages of the video is that the Teacher Retirement System benefits the entire state since members live throughout Texas, spend their retirement monies locally, and volunteer hours in their communities. Here – right outside the door of the headquarters of our client — we found a gathering of Texans from around the state, all focused on an art project of importance. What nice and unanticipated visuals to mix into the final video alongside many other shots and graphics! And how lucky we were to get an unexpected and interesting history lesson about Texas, made possible by a slight veering off the pre-planned path. One other thought: The unveiling committee was obviously aware that along with an official dedication of a state-sponsored sculpture comes the traditional and welcome spate of publicity. But they might not have imagined that their special event would have web video ramifications far beyond their intended audience. While only accounting for a few out of numerous shots in the video we re-created for TRS, the Tejano makes an actual and symbolic appearance that will be shared with millions of people in the State who benefit from the teacher retirement system. Yay for the ever-multiplying power of online video! This entry was posted on April 10, 2012 at 10:25 am and is filed under Uncategorized. You can follow any responses to this entry through the RSS 2.0 feed. You can leave a response, or trackback from your own site.